Call in sick and cancel all of your appointments! Lost World Press has just released “Punk Like Me! Liner Notes for a Revolution that Never Happened,” and once you start reading it, you will not want any interruptions. Terry James Graham’s autobiography is unlike any punk rock memoir you have ever seen. Instead of the usual friendly, conversational style peppered with acerbic wit, Terry James Graham’s expressive style and unusual phrasing result in a work of creative nonfiction that is thoroughly captivating. Although he can be wordy, none of the words are extraneous. The rhythmic ramblings are often reminiscent of the poetry of Steven Jesse Bernstein. I can easily imagine a band playing jazz-punk fusion in the background as Graham lets the words flow. “Adjacent” doesn’t have set boundaries, kind of depends on whom you ask. But I know it’s hiding somewhere under the mushroom cloud of baby-boomer fascism that huffs and puffs across L.A.’s endless patchwork of privy and privilege—under the overpasses, in that bleak industrial park and scattered among the stucco boxes that most people call home here in the entertainment capital of the world. It occurs to me as I tool around the streets and boulevards that L.A. is on its back, tongue hanging out, eyes rolled back into its coke-sniffing, Quaalude-popping head. As he progresses through the atomic age, the British invasion, and the burgeoning Hollywood punk scene, finally chronicling the last wheezes of a moribund Gun Club, Graham adopts the lexicon and cadence of the time, his narrative firmly entrenched in zeitgeist. The second chapter, “The Wayback Machine,” in which he recounts the early years of his mother, is downright Pulitzer Prize-worthy as the words come together like a painting. If not heat, dust. If not dust, thunderstorms; many days a ruinous brew of the three. West Texas in the ’30s had all the makings of a damn good country song, but not much else. Not only is Graham’s writing poetic, it is transportative. When he describes moments of musical awakening, you don’t feel like you are sitting at the bar listening to a wizened punk rock crony telling stories of his glory days. When Iggy Pop takes the stage “glaring, pouting and posturing like a rock-and-roll snake come to life” you are there. 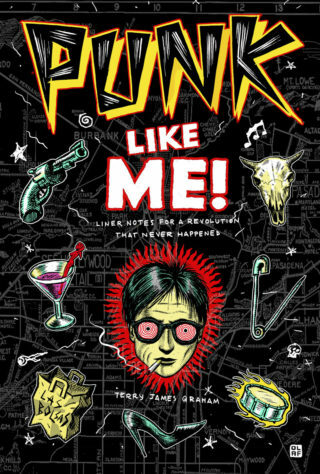 Terry James Graham will be reading and signing “Punk Like Me! Liner Notes for a Revolution That Never Happened” this Sunday from 2pm until 6pm at La Luz de Jesus. The book release party will also feature readings from punk rock luminaries Keith Morris, Dave Markey, Jordan Schwartz and Hudley Flipside. There will also be drinks, tacos, and early punk tunes spun by DJ Lee Joseph, so don’t be late. 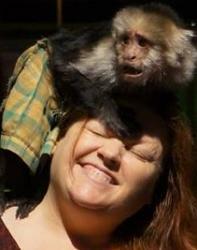 This entry was posted in Books, Music, Upcoming Events. Bookmark the permalink.